Have you heard about the Antikythera Device? It was found encrusted with deposits with the remains of an ancient Roman merchant shipwreck discovered in the Mediterranean more than a hundred years ago in 1900. The discovery in it's original form showed what appeared to be clock gears. Further studies revealed it to be a complex computer that measured the movements of celestial objects. 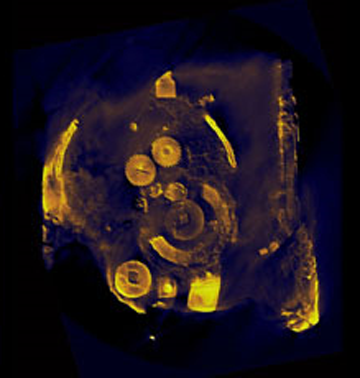 In 2005, X-Tek systems x-rayed the object and found the words for months of the year etched on it. It was easy from then on to determine where it came from since every city in the ancient Greek world had different names for the months. 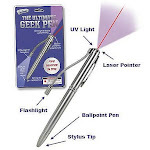 They were identified by ancient astronomy scientist Alexander Jones to be Corinthian. Corinth was ransacked by the Romans in 146 B.C. 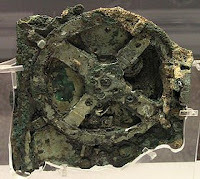 Researchers of the Antikythera Mechanism Research project are still amazed at how such an intricate mechanical device with fine gears, tiny screws, and other details could have been made at such an early time in the history of human beings.